In alignment with Madagascar’s National Malaria Control Strategy, the President’s Malaria Initiative Africa Indoor Residual Spraying (PMI AIRS) Project conducts indoor residual spraying (IRS) to reduce the burden of malaria in five districts (Farafangana and Vohipeno in the Southeast; and Brickaville, Fenerive East and Tamatave II on the East Coast). The efficacy of IRS depends on a high acceptance rate by the communities to have their homes sprayed. PMI has set a target of 85 percent IRS coverage in communities to kill the mosquitoes that transmit malaria and ensure protection. To promote acceptance, the PMI AIRS Project held a series of district-level advocacy meetings, which included traditional authorities, known as big kings or “Ampanjaka” in the Southeast and “Tangalamena” in the East. Local leaders gathered with PMI AIRS Project staff, NMCP and Malaria Control Directorate staff as well as with political authorities at the regional and district level, various associations and groups, and Peace Corps Volunteers to discuss ways to improve acceptance of IRS. The PMI AIRS Project worked with trusted members of the community, including traditional kings and local authorities, to develop an advocacy work plan for their commune, resulting in a 93.5% coverage. The traditional authorities came up with an action plan to advocate for malaria control and acceptance of IRS. 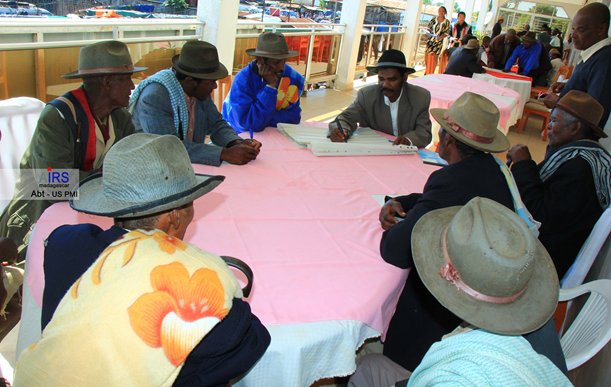 A meeting organized under the leadership of the king brought together the Fokontany village chiefs and other local and traditional authorities of the commune to encourage them to mobilize their populations to accept IRS and to intervene in the case of refusal. Kings are elected by the community, and generally, the elder in their village. All decisions to be made by and for the community must go through the king. When the king makes a decision, the community accepts it because kings are considered the representative of the ancestral spirit. The approach was reinforced with door-to-door mobilization before and during the IRS campaign with community health workers and the Fokontany Village Chiefs serving as mobilizers. The mobilizers helped reinforce the kings’ messages and ensure the 2016 campaign was a success. A total of 190,467 structures were sprayed in the East and 119,959 in the Southeast resulting in a coverage rate of 95.9% and 91.8%, respectively. Overall coverage for the five districts was 93.5%, significantly above the expected 85% target. In total, 257,301 people were protected against malaria during the 2016 IRS campaign.